I knew I was going to love this place way before I’d even stepped through the door. It’s not quite a restaurant and is rarely open, it’s quite difficult to find and even more difficult to make a booking. You are heavily vetted by the owner on the telephone before you are allowed to reserve a table, required to arrive at exactly the specified time, to an unmarked, unlit building and who tells you, when you ask for directions, that if you’re not clever enough to find his place then perhaps you’re not the sort of guests he’d want after all. Because guests you are indeed. 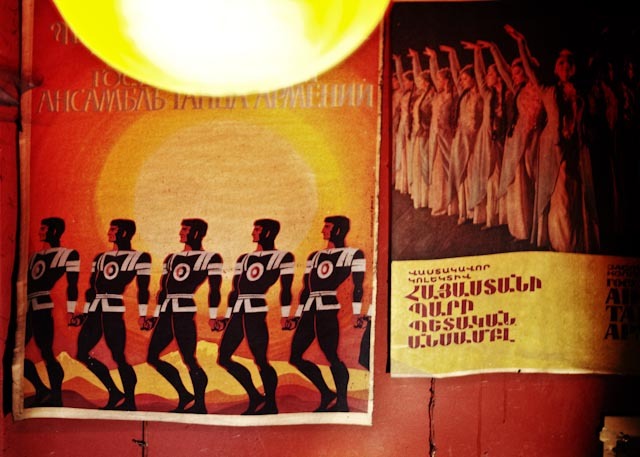 In the home of a curious and fascinating and, as it turns out, perfectly hospitable Armenian. There’s no heating, barely any lighting but there is a never-ending banquet of homely and hearty Armenian food delivered to your table, a limited but sufficient supply of wine and the invitation to join in some very interesting Armenian dancing – sort like the Hokey Cokey mixed with some high kicking and free-style breakdancing. For a highly unusual and very memorable eating experience, Aghtamar Lake Van Monastery in Exile will be hard to beat. It truly was eccentrically amazing, we should go next time you’re up! By the way, I’m loving C.W.Stoneking!